Heel Slide (ヒールスライド, Heel Slide) is Bayonetta's side special move in Super Smash Bros. 4 and Super Smash Bros. Ultimate. When preforming Heel Slide, Bayonetta attacks with a sliding kick. Heel Slide, and After Burner Kick, as seen in Bayonetta. Both Heel Slide and After Burner Kick are separate techniques purchasable at the Gates of Hell for 20,000 halos each. Heel Slide functions the same way, and if done in the air, a diagonal After Burner Kick is performed if it was already purchased. Heel Slide resembles the Slide attack from PlatinumGames' predecessor Clover Studio's game, Viewtiful Joe. After Burner Kick also has two variants depending on whether Bayonetta is ascending or descending from her jump. The attack is named after the Sega game After Burner. The downward variant resembles Red Hot Kick, another attack from Viewtiful Joe. Like most of her attacks, if the button is held, she will fire her guns to deal extra damage, but if the button is held longer, she will finish with a flip kick that knocks her opponent into the air, allowing her to follow up with one of her various aerial moves. If she only attacks with a sliding kick, she can bait and punish air dodge opponents with a timed, charged smash attacks. 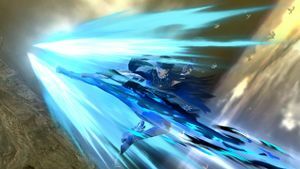 The attack also features aesthetic variations: the trails emitted are blue if Bayonetta's default costume is used, or red if her "A Witch With No Memories" alternate costume is used. When performed in the air, Bayonetta's side special is the After Burner Kick (アフターバーナーキック, After Burner Kick). This attack has her fly diagonally upwards with a kick, and can be performed twice in the air if the first attack hits an opponent. If down is pressed before performing the move, Bayonetta does a diagonal diving kick instead that bounces off opponents. Using a Hadoken-style input often makes this easier. Both variants can be comboed into each other, and various other combos can be done, such as forward aerial out of the After Burner Kick. 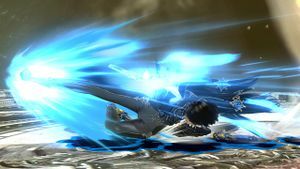 Getting hit in the air recovers an After Burner Kick, allowing Bayonetta to add it to her recovery again along with another Witch Twist. "The former is for on the ground–the latter for in the air. Hit a foe in the air and you can do a second kick." Like the other DLC characters, Bayonetta lacks custom move variations. After Burner Kick as shown by a Skill Preview in Ultimate. This is the only special move to change its name when used in the air. Strangely, in Smash 4, if Bayonetta uses After Burner Kick immediately after being released from Confusion, she can immediately use it again, even if it doesn't hit an opponent or if Bayonetta herself gets hit. This page was last edited on April 12, 2019, at 00:00.